Queen’s Park opened their season with a match against Hibernian at Easter Road on Saturday 6 September 1884. Queen’s won a hard-fought match by four goals to two. The scorers were W Millar, William “Billy” Anderson, Robert “Bob” Christie and an own goal. A week later, Queen’s opponents were Pollokshields in the first round of the Scottish Cup. (Pollokshields was a different club from Pollokshields Athletic.) Queen’s won the match at Copeland Park in Govan by four goals to nil. On the following Saturday, Partick Thistle were beaten 5-1 at Muir Park. On Saturday 27 September, Queen’s Park made their second visit of the season to Edinburgh. This time they were up against Heart of Midlothian. The sides played out a 0-0 draw before a crowd of 3,000. The match was spoiled to some extent by a strong wind and a pitch that was very soft after rain. Saturday 6 October was Scottish Cup second round day, with Queen’s Park drawn away to Thistle. The weather was particularly fine and what was described as “a pretty large crowd” was in attendance at Thistle’s Beechwood Park in Dalmarnock. An understrength Queen’s side had a comfortable 4-1 victory. Football professionalism was becoming a hot topic in England. On Monday 6 October, a meeting of the Football Association was held in London to receive the report of a sub-committee appointed to enquire into the prevalence of professionalism in English football. New rules were framed which debarred clubs in membership of the FA from playing games against clubs outwith the FA who employed professional players. On Saturday 11 October, Glasgow drew 3-3 with Dumbartonshire at Boghead Park in Dumbarton. Four Queen’s Park players were members of the Glasgow side. Three were Charles Campbell, Robert Christie and William Sellar. The identity of the fourth player is unclear. At the same time, a Queen’s Park side minus the four men on representative duty beat St Mirren 5-0 before a big crowd in Paisley. Back in England, a meeting of the principal Lancashire clubs took place in Blackburn on Wednesday 15 October. The clubs agreed unanimously that, if the FA banned professionals, they would form their own association. Queen’s Park’s new ground, also named Hampden Park, was to be opened on Saturday 18 October 1884. On the previous day, the North British Daily Mail gave some details of what it described as Queen’s Park’s “handsome new ground”. The ground was fully six acres in extent and a short distance from the Govanhill Car Terminus. It was also in the immediate vicinity of the proposed Govanhill Station of the Cathcart District Railway. The railway contractors had been responsible for levelling the pitch, which was a turfed two acres, practically flat and with just sufficient fall to allow natural drainage. The running track was exactly a quarter mile and was 15 feet wide. The bicycle track would not be completed until the following spring. On the south side of the pitch, on rising ground, was a grand stand that was 80 yards long and had seating for 900. The area in front of the stand was terraced. On the north side of the ground was another grand stand, 100 yards long and seating 1,200. There was a new brick pavilion in the south-west corner of the ground. 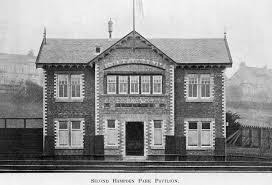 As well as changing facilities, the pavilion had club and committee rooms. The Evening Times said that the entrances to the ground were at the north-west corner. The new Hampden Park opened on Saturday 18 October as scheduled, with a match between Queen’s Park and Dumbarton. 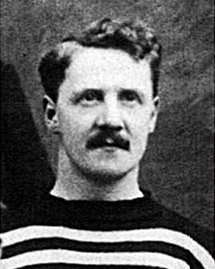 As the oldest member of the Queen’s Park side, Charles Campbell had the honour of taking the kick-off before a crowd of up to 6,000. Queen’s dominated the game but it finished goalless. One newspaper commented that the pitch was almost dead level, showing a remarkable contrast to the old Hampden Park. The Spiders’ line-up on that momentous day was – G Gillespie; J McDougall and J G Wallace; C Campbell and J G MacDonald; R M Christie, D S Allan, W Harrower, W W Watt, W Anderson and N McWhannell. On Thursday 23 October, Queen’s Park were in Lancashire for a match with Darwen, before what was described as a moderate attendance. Queen’s had the advantage of a stiff breeze in the first half and led 1-0 at the break through a goal in the thirtieth minute (scorer not known). The Englishmen had the better of the second period and equalised through Marshall in 75 minutes. That ended the scoring. Two days later, Queen’s Park suffered one of the most sensational defeats in the long history of Scottish football. The occasion was a Scottish Cup third round tie at Hampden Park. The Spiders’ opponents were near-neighbours Battlefield. The day was wet and windy and few spectators were present for what was expected to be a one-sided encounter. Falls were frequent on the heavy pitch. Queen’s took the lead in seven minutes through William Harrower, the first goal scorer at the new ground. John Sellar, brother of William who played for both Queen’s Park and Battlefield, equalised and then Walker put Battlefield ahead with a controversial goal. Robert Christie thought he had drawn Queen’s level but his goal was ruled offside. Queen’s did succeed in equalising through an Angus own goal but Battlefield struck again with four minutes to go. The Spiders finally woke up but it was too late and their Scottish Cup campaign was over. The wet weather continued and Queen’s Park’s game with Rangers on Saturday 1 November was postponed due to a waterlogged pitch. The Spiders were back down south on the following Saturday taking on Aston Villa in a challenge match. The match attracted a crowd of over 15,000 to Wellington Road in Perry Barr. As was often the case in those days, the wind was a major factor in the outcome of the match. Despite fielding a weakened side, Queen’s dominated the first half and led at the interval by a Billy Anderson goal. Arthur Brown equalised for Villa in the second half after a weak clearance by Peter McCallum in the Queen’s goal. The Birmingham side then got a second goal from a corner kick to secure victory by two goals to one. The match had been possible because Stoke had scratched from their first round FA Cup tie with Queen’s. On Saturday 15 November, there was a large crowd at Clune Park in Port Glasgow for a match between Port Glasgow Athletic and Queen’s Park. The outcome was a comfortable 6-1 victory for the visitors. Two of the goals came from William Watt and Robert Christie. The scorers of the other four goals are unknown. The first meeting of the season between Rangers and Queen’s Park took place at Kinning Park on Saturday 22 November before a crowd of around 2,500. The Spiders won 3-2 “after an hour and a half of most gentlemanly play on both sides” (North British Daily Mail). The weather was good but the pitch was slippery. Queen’s took the lead in 25 minutes when William Watt fired home a Christie cross but Gossland equalised for the Light Blues before the interval. Soon after the restart, Billy Anderson dribbled past two defenders to score and, a few minutes later, Ninian McWhannell made it 3-1. Due to an injury, Queen’s had to play most of the second half with ten men and Gossland scored a second for Rangers near the end. A week later, Queen’s Park met Dumbarton before a crowd of 3,000 at Boghead. Both sides were below strength and an even match ended in a 1-1 draw. R Brown give the Sons the lead in 51 minutes and Ninian McWhannell equalised ten minutes from time. On Saturday 3 December 1884, Crewe Alexandra visited Hampden Park in the second round of the FA Cup. The weather was very unpleasant, with high winds and heavy rain, and only around 1,500 fans turned up. (There was, of course, no cover at grounds on those days.) Crewe came with a good reputation and had six Welsh internationals in their side. There was a shock for the Spiders in the opening minutes when Crewe took the lead from a scrimmage. After 30 minutes, David Allan equalised with a fine shot and, almost immediately afterwards, Robert Christie ran the length of the field to give Queen’s the lead. No sooner had the second half started than torrential rain began to fall and, by mutual consent, the two teams headed for the shelter of the pavilion. After a short period, Queen’s Park wanted to resume the match but Crewe refused and the Spiders were awarded the tie. On the following Saturday, Queen’s Park and the 3rd Lanark Rifle Volunteers, now increasingly known simply as Third Lanark, met at Cathkin Park. The weather was poor but it was a good game given the state of the pitch. Queen’s won 2-1 with goals from either William Harrower or William Watt and Billy Anderson. Marshall replied for the Warriors. There was a representative match at Hampden Park on Saturday 20 December when Glasgow hosted London. The 5,000 spectators saw a 6-2 victory for the home side. Six Queen’s Park players were in the Glasgow eleven – David Allan, Billy Anderson, Charles Campbell, Robert Christie, William Harrower and W M MacDonald. The team also included two men with Queen’s Park connections – William Sellar (Battlefield) and Walter Arnott (Pollokshields Athletic). Anderson, Campbell and Harrower were on the scoresheet, as was William Sellar. On Saturday 27 December, Dumbarton visited Hampden Park. Despite the ground being slippery, the two sides produced a fine match. Brown shot Dumbarton into a half-time lead but second half goals from William Harrower and Alex Hamilton gave Queen’s the victory. On New Year’s Day, Queen’s Park played a return match with Aston Villa at Hampden Park. A thaw had left the turf slippery but the 6,000 spectators were treated to one of the best games of the season to date. Queen’s half back MacDonald was injured just after the kick-off and the Spiders had to play the remainder of the game with ten men. Queen’s Park took the lead through Billy Anderson before any Villa player had touched the ball and Robert Christie made it two in seven minutes. Whateley pulled a goal back but Billy Anderson restored the Spiders’ lead before half-time. An Anderson header put Queen’s 4-1 ahead early in the second half but two Brown Strikes set up an exciting finish. However, the ten men held on for a 4-3 victory. While the respective first elevens were fighting it out at Hampden Park, Queen’s Park won the battle of the second elevens with a 3-0 victory before a crowd of 2,000 at Perry Barr. Miller (2) and Armstrong got the Spiders’ goals. The games were coming thick and fast. On Saturday 3 January, Queen’s Park were in Staffordshire competing against Leek in the third round of the FA Cup. A crowd of more than 5,000 enjoyed a game that was evenly contested throughout. The ground was very hard and this affected the quality of play. Robert Christie put Queen’s ahead and the lead was doubled from a scrimmage. Allen pulled a goal back for Leek with a shot from distance but Billy Anderson restored the Spiders’ two goal lead from a Christie pass. Allen struck again for Leek but Queen’s Park won 3-2 to progress to the next round of the competition. Queen’s Park were back at Hampden Park on the following Saturday when Vale of Leven were the visitors. This was the first meeting of the two sides in Glasgow in two years but only a few fans were present. The weather was terrible and much of the pitch was covered in water. Vale, playing with the wind, were two ahead at the break but second half goals from David Allan, William Watt and Robert Christie gave Queen’s the win. It was FA Cup time again on Saturday 17 January 1885. Queen’s Park’s opponents in the fourth round tie were Old Wykehamists from Hampshire. The visitors had beaten some strong English sides and came to Glasgow with a great reputation. However, they were blown away by a Queen’s Park side in top form. Queen’s, with the wind at their backs, were 6-0 ahead at the break. According to the Glasgow Herald, the scorers were Anderson, Allan, Watt, Anderson, Christie and Watt. The North British Daily Mail, on the other hand, opted for Anderson, Allan, Hamilton, Anderson, Christie or Watt and Harrower. The 3,000 spectators saw only a single goal in the second half. It came near the end when Robert Christie took advantage of clever play by Billy Anderson. The match ended, therefore, in a resounding 7-1 victory for Queen’s Park. The Spiders team was – G Gillespie; W Arnott and J Harvie; C Campbell and J Wallace; R M Christie, D S Allan, W Harrower, W W Watt, W Anderson and A Hamilton. On Monday 19 January, the latest in a series of meetings about professionalism in football took place in the Freemasons’ Tavern in London. Over two hundred delegates of Association clubs were present. The FA Secretary, Charles Alcock, moved a resolution passed by the FA General Committee which proposed “that it is expedient to legalise professionalism under stringent conditions.” An opposing amendment was supported by Queen’s Park. 113 delegates voted for the motion, with 108 against. Although a majority were in favour, a two thirds’ majority was required for the resolution to be passed. Few matches took place on Saturday 24 January due to protracted frost and Queen’s Park were not in action. A week later, normal service was resumed and Queen’s met 3rdLanark Rifle Volunteers at Cathkin Park before a small crowd of around 1,000. The Spiders won 5-0 with goals from William Harrower (3), Robert Christie and Alex Hamilton. On Monday 7 February, Queen’s Park beat Renton by four goals to one. The match was played at Cathkin Park to protect the new pitch at Hampden. The day was very wet and the players had difficulty keeping their feet. Billy Anderson got Queen’s opening goal and Robert Christie numbers two and three. Opinions differed as to whether Anderson or Christie scored the fourth. On the following Saturday, the 12th meeting of Glasgow and Sheffield took place at Hampden Park. There were several thousand spectators in attendance to see Glasgow record a resounding 9-1 victory. Six Queen’s Park players featured in the Glasgow side – David Allan, Walter Arnott, Charles Campbell, Robert Christie, Alex Hamilton and William Harrower. Several of the Queen’s players scored in the match but the reports if the identity of the goal scorers varied enormously. On the same day as the Sheffield game, what was described as a “scratch” Queen’s Park side drew 3-3 with Pollokshaws at Broom Park in Cowglen. Few players with first team experience featured in the Spiders’ eleven. On Saturday 21 February, Renton and Vale of Leven drew 0-0 in the Scottish Cup Final at Hampden Park. However, the big game for Queen’s Park was a FA Cup sixth round tie with Notts County at Trent Bridge in Nottingham. (Queen’s had received a bye in the fifth round.) Extra stands had been erected at the ground but such was the size of the crowd (up to 20,000) that encroachment by spectators presented a great problem. With the benefit of the wind and sun, Queen’s Park pushed County back in the first half and took the lead through Robert Christie Just before the interval. At half-time, the crowd broke into the field of play and it was twenty minutes before the pitch could be cleared. Queen’s Park claimed the game and played on under protest. Facing the elements and with Robert Christie limping heavily, Queen’s were up against it in the second period. In 65 minutes, Gunn hit an equaliser, which resulted in further crowd encroachment, and then Cursham put County into the lead. Queen’s Park fought back, however, and William Sellar forced the ball past Coulby in the Notts goal to bring the scorers level. There was no further scoring and, two hours and ten minutes after the game had kicked off, the match ended 2-2. The referee, Mr Pierce-Dix, ordered the clubs to play an extra half hour but Queen’s Park refused on account of spectators being on or over the line of play. Notts County formally kicked another goal and claimed the match. The FA gave consideration to the matter on the following Monday and ordered a replay at a neutral ground. The FA decided that the cup replay would take place at Derby on the following Saturday. Queen’s Park had to cancel a planned challenge match with Blackburn Rovers. Given that replays were normally held at the ground of the club that was away in the first game and that Derby was only a relatively short distance from Nottingham, it would be true to say that Queen’s Park were none too pleased with the choice of venue. The match at the Derby Cricket Ground attracted a crowd of almost 18,000, mostly supporting Notts County. The Midland Railway Company took 8,000 fans from Nottingham in four special trains and many others travelled by ordinary service trains and by road. Following the problems at Trent Bridge on the previous Saturday, the posts round the pitch had been sunk deeper and a new wire rope was expected to have the strength to defy the weight of the greatest crowd. While Queen’s Park were battling away in Derby, the Scottish Cup Final was taking place at Hampden Park. Renton took the honours with a 3-1 win over their Dunbartonshire neighbours Vale of Leven. On Saturday 7 March, five Queen’s Park players – Anderson, Arnott, Campbell, Alex Hamilton and Harrower – were in the Glasgow side that beat Scotch Counties either 3-0 or 3-1 (reports varied) before a 4,000 crowd at Hampden Park. John Holm, William Sellar and Woodville “Woody” Gray also took part but were listed as Pollokshields Athletic players. Anderson and Hamilton scored two of Glasgow’s three goals. On the following Monday, a Committee meeting of the Football Association decided that the semi-final replay would take place in Edinburgh on 28 March 1885. This was the date originally set aside for the FA Cup Final. Six Queen’s Park players were in the Scotland side that drew 1-1 with England at London’s Kennington Oval on Saturday 21 March. They were David Allan, Billy Anderson, Walter Arnott, Charles Campbell, John Gow and Alex Hamilton. William Sellar also played but as a Battlefield Player. Two days later, the Scots overwhelmed Wales by eight goals to one in Wrexham. Anderson, Allan, Arnott and A Hamilton played. The goal scorers in the match are unclear. The Scotsman said that Billy Anderson scored twice and David Allan three times. Other reports credited Anderson with either two or three goals and Allan with only one. The SFA website says that Anderson scored two and Allan one and it has to be assumed that this is correct. Queen’s Park’s FA Cup semi-final replay with Nottingham Forest took place on Saturday 28 March 1885 as scheduled. The only football ground in Edinburgh capable of staging such a match was the St Bernard’s ground at Powderhall but the pitch was too narrow to meet the FA’s criteria. However, the headmaster of Merchiston Castle School made the school’s cricket ground available for the match. The quality of the turf was said to have been ideal for football. The match attracted a crowd of approximately 15,000 – the largest attendance ever for a sporting event in Edinburgh. A grand stand had been specially constructed to help accommodate the spectators. People travelled to the match from all over Scotland, with five special trains leaving Glasgow for the capital. Special trains also brought fans from Nottingham. The Lord Provost of Glasgow and the Mayor of Nottingham were among the spectators. Queen’s Park were without Billy Anderson, Robert Christie, John Gow and John Smith for the match. All were injured. Nottingham Forest were unchanged. The weather was dull and windy and Queen’s played into the breeze in the opening half. Despite this handicap, it was the Spiders who took the initiative and were two goals to the good at the interval. The opening goal came in 24 minutes when a Forest player, either Hancock or Widdowson, headed through his own goal. The second was scored by William Sellar from an Alex Hamilton cross. Queen’s Park were well on top in the second period and scored a third goal when the Forest goalkeeper could only parry a shot and Sellar followed up to knock the ball between the posts. The Queen’s Park side that achieved a memorable win was – G Gillespie; W Arnott and W MacLeod; C Campbell (captain) and J MacDonald; N McWhannell and A Hamilton; W Harrower and W W Watt; W Sellar and D S Allan. The FA Cup Final between Queen’s Park and Blackburn Rovers took place at the Kennington Oval only a week later. The Oval was not a good ground for football, with only one small permanent stand and a few unimpressive little temporary stands dotted here and there, but it was the preferred choice of the Football Association. Three special trains, each well patronised, left Glasgow on the Friday evening carrying fans to London but the bulk of the crowd of around 15,000 favoured the English side. The match itself was exciting and full of incident. The Manchester Times reported “A finer all-round game has scarcely ever been witnessed and never surpassed.” An understrength Queen’s Park side played with great spirit but failed to reach their best form and Rovers had the edge throughout. The Spiders were unlucky with the weather. They had to face a bright sun and a strong cold wind in the first half but the wind then turned in Blackburn’s favour in the second period. They were also unfortunate to have to take the field without several key players, the latest absentee being William Harrower. Rovers took the lead through Jimmy Forrest in 18 minutes and, with around 20 minutes to go, either Forrest or James Brown made it two with a powerful shot. Queen’s battled to the end but to no avail. Queen’s Park– George Gillespie; Walter Arnott and William MacLeod; Charles Campbell (captain) and Ninian McWhannell; Alex Hamilton and John MacDonald; Billy Anderson and William Sellar; David Allan and Woody Gray. Blackburn Rovers– Herby Arthur; Richard Turner and Fergus Suter; Hugh McIntyre, George Haworth and Jimmy Forrest; Joe Lofthouse and Jimmy Douglas; Joe Sourbutts; Howard Fecitt and James Brown. On Monday 6 April, the Corinthians embarked on a short and very intensive tour of England. David Allan, Charles Campbell and Alex Hamilton formed part of the touring party. On the Monday, the Corinthians beat Preston North End 1-0; on the Tuesday, they drew 3-3 with Derby County; on the Wednesday, they beat Blackburn Rovers 2-1 (a measure of revenge for the Queen’s Park men? ); and on the Thursday, they beat Blackpool 2-1. On Thursday 9 April, Queen’s Park drew 2-2 with Dunfermline at Lady’s Mill Park in Dunfermline. The strength of the Queen’s side is not known. The Glasgow Merchants’ Charity Cup Committee had decided that Queen’s Park, Rangers, Dumbarton and Renton would compete in that season’s competition – a decision that did not please Battlefield and Partick Thistle. The first of the two “semi-finals” between Rangers and Dumbarton took place on Saturday 11 April. Queen’s Park were not in action on that day but five Spiders’ players were in the Glasgow that drew 0-0 with Edinburgh at the Powderhall Grounds. Glasgow had to play almost the entire match with ten men. The Queen’s Park men involved were David Allan, Walter Arnott, Charles Campbell, George Gillespie and Alex Hamilton. Woody Gray, William MacLeod and William Sellar also played but as representatives of their parent clubs – Pollokshields Athletic, Cowlairs and Battlefield. A week later, Queen’s Park played a friendly match with Northern at Hyde Park in Springburn. Queen’s won the match easily but the score is anyone’s guess. The Evening Timeswent for 5-1, the Glasgow Herald 4-0 and the North British Daily Mail 5-0. On Saturday 25 April, Queen’s Park beat Renton at Hampden Park in the second Charity Cup “semi-final”. A crowd of around 4,000 saw Queen’s progress to the final with a 3-2 victory. The goals came from William Harrower (2) and William Watt. The Glasgow Merchants’ Charity Cup Final between Queen’s Park and Dumbarton took place at Hampden Park on Saturday 9 May 1885. Having lost out in the Scottish Cup and the English FA Cup, Queen’s were particularly keen to lift the trophy and fielded the strongest side they could muster. A doubling of the admission price and unpleasant weather restricted the attendance to 4,000 or so. In an entertaining first half, both sides had spells of dominance but Queen’s Park got the only goal of the period. William Watt was the scorer after a brilliant run. Queen’s were well on top in the second half but the closest they came to adding to their lead was when Robert Christie hit the post. The match ended in a 1-0 win for Queen’s Park. The Spiders side that won the Charity Cup for the seventh time was – George Gillespie; Andrew Watson and John Harvie; Charles Campbell and John Gow; Alex Hamilton and William Watt; Ninian McWhannell and William Harrower; David Allan and Robert Christie. It appears that Queen’s Park went down 1-0 to Rangers on Wednesday 13 May but nothing is known about the match. On Thursday 14 May, the Evening Times reported that it was understood that the result of consultation by a special committee of the Football Association would result in the legalisation of professionalism in England. The season ended on Saturday 30 May 1885 with a four team 11-a-side tournament at Cathkin Park organised by the 3rdLanark Rifle Volunteers. The event attracted a crowd of 5,000 and was by all accounts a great success. In the first match, 3rd Lanark beat Rangers by a goal to nil. Queen’s Park then beat Pollokshields Athletic 3-0. The final between 3rdLanark and Queen’s Park ended goalless. The outcome was decided on the number of corner kicks awarded and Queen’s were the winners by one corner to none. The winning players received gold badges (medals). Although the season proper was at an end, many of the clubs held sports days during the summer and these included four-a-side football tournaments. On Wednesday 17 June, Queen’s Park won the football first prize at the Hamilton Academical FC Sports.